One of my oldest gaming memories, in fact one of my oldest memories in general involves the cult classic game Kid Icarus. I remember it happened when we were still living at our old house, so I couldn’t have been more than 3 years old at the time. 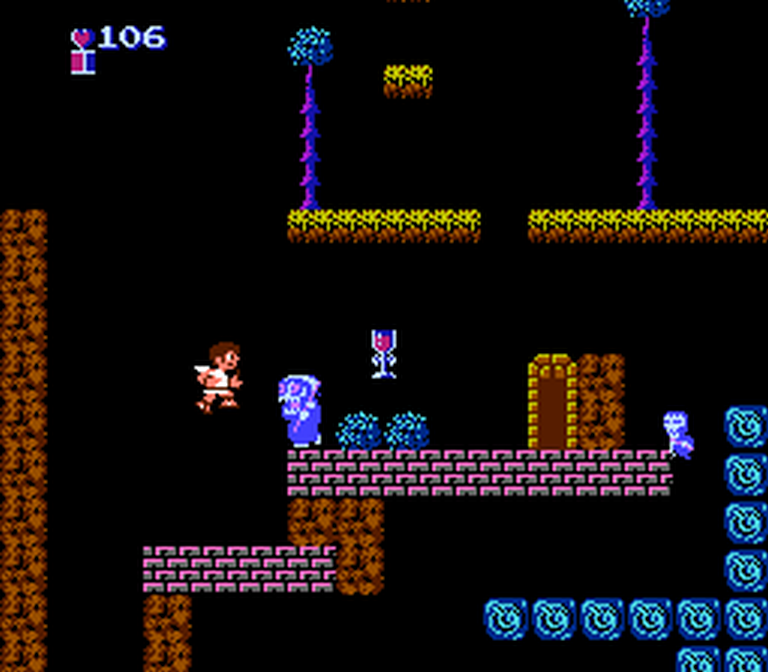 I loved playing Kid Icarus, even though I was terrible at it. One day, my dad gave me a notepad with all kinds of level codes on it. How could he have possible gotten these codes? He’s a dad, and dads don’t play video games. When I asked him, he told me he “Hot wired the game until it told him all its secrets.” To this day, my dad is still an amazing mechanic, so at the time the pictures in my mind of him with jumper cables, a car battery, and a typewriter somehow hooked up to this NES cartridge made complete sense to me. Like I said, dads don’t play video games, so this was the only possible way. Ever since then Kid Icarus has always held a special place for me, and I’m so happy to see Pit getting a little more attention now thanks to his inclusions in the Smash Bros series. As much as I love the game, I’ve never actually sat down to beat it. I barely ever even make it out of the first stages because it’s so hard. So join me as we tackle this monster of a game together! A little back story first. Long ago in the Kingdom of “Angel Land” there ruled two beautiful Goddesses. Palutena, the Goddess of Light, loved mankind and helped them to be happy and peaceful. However, Medusa, the Goddess of Darkness, hated mankind and would destroy their crops and turn people to stone. In a moment of rage, Palutena transformed Medusa into a snake haired monster and banished her to the Underworld. Fueled by anger and with the help of the monsters of the underworld, Medusa led a surprise attack against Palutena. Palutena’s army was quickly defeated and Medusa imprisoned her inside the Palace in the Sky. With the last of her strength, Palutena sent a magic bow and arrows to the young warrior Pit, who had been imprisoned deep in the Underworld. That’s where the game begins. As Pit, currently in the deepest part of the Underworld, you must travel the distance up to the Palace in the Sky to rescue the Goddess Palutena and restore peace to the world. The game plays out primarily as a platformer game, though it does have a touch of RPG mixed in too. Things like an actual inventory, a health bar, and stat increases make this an amazing title in the latter half of the game. Unfortunately, those same mechanics cause the start of the game to be nightmarishly hard due to lack of items and health. Probably one of the first things you’ll notice right away is that it’s not your typical “travel to the right” video game. Instead you’re trying to travel upwards towards Angel Land and the Palace in the Sky. This adds a great deal of platforming to the game, but also causes one of the most frustrating aspects of the game. As you climb higher, any platform that falls off the bottom of the screen is gone forever, replaced by an instant death pit. A single missed jump could mean starting over the whole stage, even if a platform was under you just seconds earlier. Another interesting mechanic is the fact that the screen loops left and right. What I mean by this is that if you move off the screen to the left, you’ll automatically show up on the right side of the screen, making the world more of a round pillar than a flat wall. Just be aware of your surroundings, because the monsters can and will also travel around the screen like this. As you travel up, you’ll encounter a wide variety of monsters like the Shemum snake like creatures and the Monoeye flying eye monsters. These monsters will all come in waves, and unlike most platformers where you want to rush through it, this game rewards and practically requires you to slow down and deal with the waves of enemies. Not only will killing the monsters increase your score, they’ll also drop hearts which are the currency in the game. You’ll need a lot of hearts to buy all the items you’ll need, so slow down and enjoy the hunt. On the subject of monsters, I have to point out the Reapers. They are one of the most fun and also most annoying enemies in the game. But they were my favorite, and sometimes I’d play just to see them. They are slow moving, walking back and forth on whatever platform they’re on, as opposed to most enemies who will jump off the edges. What makes them so much fun is how they react when they see you. They change from the usual calm, slow moving menacing character into a hyperactive psycho. They start running around and screaming while also summoning tiny flying Reapettes to hunt you down. The music even changes to a weird almost laughing sounding music. It bizarrely funny and made a tough enemy actually quite enjoyable. Scattered around the level as you travel upwards are also various different rooms to explore. The stores can be particularly useful, offering you life saving items in exchange for your hard earned hearts. Here, you can buy glasses of the Water of Life to instantly restore your health, or bottles of it which will automatically restore your health should it ever reach zero. If you save up enough, you should really invest in the barrel, which allows you to carry up to 8 bottles of the Water of Life at a single time. Probably the most appreciated item they sell is the Angel’s Feather, which will save you if you miss a jump. Why start over the whole stage because of a single bad jump? On occasion you’ll even find a treasure room. Break as many jars as you want, and collect as much as you can, but watch out for the God of Poverty. If you break his jar, the fun is over and you end up with nothing. However, if you break his jar last you’ll be highly rewarded. If you’re really lucky, you’ll get the credit card. It lets you buy anything you want from the stores, but all your hearts go towards paying off the purchase. You’ll also encounter monster dens full of Specknose, flying nose like monsters. These rooms can be tough, and dangerous, but each monster rewards you with 10 hearts, so it’s well worth the risk. They fly in regular patterns, so it’s best not to move around a lot, and then take them out at your own pace. With the odds stacked against him, poor little Pit is going to need all the help he can get. He’s not alone on his quest though. Occasionally Zeus God of Thunder will show up to help train Pit into a mighty warrior. At least I want to believe he’s there to help. When you encounter him, he starts throwing solid iron Monolith plates at you. Should he fail to kill you, he’ll reward you by allowing you the use of one of the three different weapons. There’s a fireball that wraps around the arrows making them stronger, a Sacred Bow to shoot the full length of the screen, or the Protective Crystals which makes 2 small crystal orbs circle Pit and attack enemies that get too close. When Zeus isn’t joyfully throwing stuff at you, he’ll also be judging how strong of a warrior Pit is. If he deems Pit worthy before reaching his chamber, Zeus will upgrade his arrows so they hit stronger. At the same time he’ll also change Pit’s color pallet for some reason. The gods work in mysterious ways I guess. Endure all the challenges and eventually you’ll make it to the end of each stage. It can seem impossible at first with how weak Pit starts out, but that’s why you want to really slow down and kill as many enemies as possible for the highest score you can get. Your score also doubles as your experience points. When your total score reaches certain checkpoints, you’ll be leveled up, increasing your health going forward. With so many enemies, you’ll be so glad to have every extra point of health you can get. Progressing up the tower, the monsters don’t change much. Instead, only the level design changes. Adding new elements like icy platforms which threaten to have Pit slide right off into the abyss. They’re also thinner than a normal platform, which allows Pit to drop down through it when you try to crouch. This will also sometimes send you flying into the abyss with a simple wrong button press. Still more dangers await Pit as he has to cross over lava pits which will damage him on contact. So remember, don’t go swimming in the lava pools. But truly, the most dangerous enemy is yourself. The balance between reaching the end of the level, and grinding to acquire enough hearts for essential items can often be fatal. For example, enemies like the Mcgoo can be a blessing and a curse. These living magma monsters seep up out of the ground to attack Pit. They’re easy enough to avoid, simply side step and duck to avoid their projectile attack. Why I bring these guys up is because they’re one of the few enemies that will spawn infinitely, making them great for harvesting hearts. If you’re not careful, especially early on, you’ll get hit occasionally. Do you risk dying for the hearts you need or do you press forward to the end of the level without enough to buy items for yourself? This question more often than not ends in my death and time wasted. By the time I reached level 1-3, I opted to start the game over because I had progressed too quickly and thought starting over and slowing down this time would be the better choice. Slowing down was exactly what I needed. I managed to get enough experience to get a second bar of health by the end of level 1-2. This gave me twice as much health to farm hearts in 1-3 until I had enough to buy a barrel. As I mentioned before, the barrel lets you hold up to 8 bottles of Water of Life, effectively adding up to 8 more bars of health. Upon entering level 1-4, you’ll notice a drastic departure from the previous levels. Gone is the long trek upwards, replaced with a labyrinth that in the first of 3 fortresses. Here, you have to navigate your way through the various rooms fighting enemies and tracking down Medusa’s general entrusted with one of the three Sacred Treasures. If you want to find your way around, you’ll have to find the map hidden somewhere in the fortress, as well as purchase a pencil and torch from one of the markets to fill it. The fortress is possibly the best place to collect hearts and items in the game. The enemies all respawn endlessly upon entering or reentering their room. There’s also healing spas in the fortress to get you back up to perfect condition. This is what made getting the barrel before now so important. Between the endless enemies and the healing spas, there’s nothing stopping you from filling up your inventory with Water of Life for the challenges ahead. The fortress is unfortunately home to one of the most annoying yet comical enemies in the game, the dreaded Eggplant Wizard. These crazy enemies usually show up in pairs, throwing eggplants in high arcs at Pit. If that wasn’t bad enough, coming in contact with one of these eggplants will transform Pit into an eggplant himself. He can still run around, and somehow climb up and down ladders, but he can’t attack. The only way to break the eggplant curse is to visit one of the hospitals hidden somewhere in the fortress. In addition to all the items you collect, there’s one other source of assistance waiting for Pit in the fortress. Scattered around the fortress are statues that look like Palutena’s Centurian warriors. In truth, these ARE Centurians who have been turned to stone by Medusa. If you hit them with one of your mallets you can free them from their stone prison. This is completely optional, but every warrior you free will aid you in the upcoming battle against the fortress guardian. Speaking of the fortress guardian, this first fortress is guarded by Twinbellows, a two headed fire breathing dog. As far as bosses go he’s not that tough, especially if you properly prepared yourself with lots of Water of Life. You probably won’t need them though because he is very slow moving, and attacks very rarely. Plus you have all your Centurian buddies helping you kill him. If you took the time to save them that is. They are laughably weak though, and will each die in a single hit. Your efforts are rewarded with the retrieval of one of the 3 Sacred Treasures. You can’t do anything with it, but it’s nice to have. So it functions about as well as most antiques. If you took the time to really fill your inventory like I did, you might also want to prepare for a few minutes of your score calculating. This is also rewarding in the end as my health is now maxed out at 5 bars, not counting the 8 bottles of Water of Life I have. Having climbed all the way out of the Underworld, Pit now walks free across the Overworld. The change of scenery isn’t even the half of the changes here. If you haven’t noticed already, we’re no longer climbing straight up. We’re instead traveling the more traditional left to right platformer the system is known for. This makes the game so much easier, mostly because of the absence of the once ever present bottomless pit. That mechanic is easily the worst part of this game. To make things even better, there is a healing pond right at the beginning of the world. Not only does this heal you, but it is possibly the first opportunity to activate my Protective Crystals to circle around Pit. Before now, my energy level wasn’t high enough to use the weapons Zeus gave me. Then the fortresses have some special magic that makes the weapons useless. Anyway, these orbs will damage any enemy they come in contact with, instantly killing most of the weaker enemies. This again makes the game so much easier. Honestly, the Underworld is going to have been the hardest part of the game if everything keeps getting easier like this. In all honesty, the hardest part of the Overworld appears at the beginning of the second area. There is a chamber where Zeus will wait for you to upgrade your bow again. What makes this so complicated is the fact that it appears so early in the level that it’s hard to get enough points for him to actually show up. Is this mandatory? No, you can complete the level and the game without it. However, the game has multiple endings, and you need it if you want to get the best ending, which I want to see. I have to admit I was a bit hasty calling that the hardest thing about the Overworld when in fact it isn’t. The hardest, or at least most annoying, thing about the overworld has to be the Pluton enemies. These little ogres are completely immortal. No amount of damage you do to them will ever kill them. That alone is bad, but what makes them so memorably annoying the fact that they steal your special weapons if they touch you. My Protective Crystals and Sacred Bow, both gone in an instant because of these guys. Oh but don’t worry, you can always buy them back at one of the black markets. If you don’t mind paying an arm and a leg for them that is! I know I’ve said how much easier the Overworld is than the Underworld, but that doesn’t mean the Overworld is a walk in the park. As far as level composition is concerned, the overworld can be quite difficult at times. The sheer volume of enemies has drastically increased as the rock monsters Rokman will fall from the heavens, or pink porcupine Minos will jump from the ground, and the occasional flying frogs Keron will torment Pit to no end. Though we’ve moved away from the bottomless pit, it’s not really gone. There are many bottomless pits still waiting to claim another life in the Overworld. This time around they’re just a bit more cleverly integrated into the level in the form of a watery grave. Pit apparently can’t swim at all, and a miscalculated jump from any of the small ledges could mean the end for our hero. And as evident by the mass graveyard, Pit wasn’t the first to perish on this journey. Before you know it, you’ll be upon the second fortress. Though the size has increased, the basic strategy remains the same. Restock your items and get ready for the challenges ahead. Of course this won’t be easy, especially with the Eggplant Wizards returning ready to put their eggplant curse on poor Pit. Curiously, they seem to be joined by roaming groups of Goombas. Sorry guys, but you’re game is in another castle. Despite its increased size and difficulty, gathering supplies this time around will feel much easier. Not only do we already have some items left over from last time, but with the increased health, and strength, Pit can take on tougher groups of enemies to gain hearts faster than ever before. The room I picked would gain me 80 hearts every time I entered. It was also only 2 rooms away from the store, which was itself only 2 rooms from a healing spring. I can’t really ask for a more perfect training area. I accidentally stumbled upon the fortress guardian Hewdraw’s chamber a bit earlier than I meant to, leaving me more vulnerable than I would have liked to be. While I had already filled my inventory, I hadn’t freed many of the petrified Centurians, leaving Pit quickly on his own. In my panic, I took more damage than I probably should have. Hewdraw is actually a fairly easy though time consuming boss. He has a very rigid movement pattern, bouncing up and down out of the lava pools in perfect arches, only turning when he hits a wall. Other than physical contact, he has no attacks or projectiles of any kind. What makes him difficult is the fact that only his head takes any damage. Trying to attack a small fast moving target trailed by a damaging tail all while standing on small platforms over pools of lava. Patience was the key to this one as Hewdraw eventually falls, leaving behind the second Sacred Treasure. Pit has finally started his accent to the Skyworld. We once again return to the original vertical platformer of the Underworld levels. This time around will be a bit easier than in the Underworld. With 5 bars of health, all the weapon upgrades, and a stock of Water of Life, the enemies don’t stand a chance. Even if those enemies are Metroids. Wait, what are you guys doing in this game anyway? While the enemies may not be much threat anymore, the platforming is at its hardest here in Skyworld. With plenty of tiny platforms to jump across, that bottomless pit is looking even more threatening than before. Patience is definitely needed if you plan to make it to the Palace in the Sky and rescue Goddess Palutena. I ended up rushing through these stages, especially in comparison to the Underworld levels. One thing that did slow me down however were the Pluton Flies. Similar to the Pluton enemies from the overworld, these guys are invincible, and will steal your weapons if they touch you. They are however much easier to get past this time around. While the Plutons jumps around and would more or less dart at you, the Pluton Flies make only a single horizontal rush at you. Once you’re at the same height as them, they will bolt across the screen. Jumping into their vision and falling back down will clear them from your path without much trouble. Finally we reach the 3rd and final fortress. With 64 total rooms, this is the largest and most confusing of all the fortresses. Just like with the others the fortress remains a great place to restock before the end. That’s truer than ever this time, as it’s the final chance you’ll have before facing Medusa herself in the final level. As before, the Eggplant Wizards will cause no end of torment for you, but they ramp it up for one last assault this time. Towards the end of the fortress is a room with two wizards and very little room to dodge, as well as one throwing eggplants up at Pit. Getting hit with an eggplant here will have you back tracking a huge distance back to the hospital to cure yourself. Getting past the eggplant wizards leaves only one last deception in the form of a store. This store is placed in the room immediately before the fortress guardian, making it very tempting to buy things. However this game has multiple endings based on how well you did in the game. One of the criteria is how many hearts you have. Ending the game with anything less than 999 hearts will disqualify you for the best ending in the game. If you do buy anything from this store, you only have access to a single enemy in the previous room to restock your hearts as the room below the store will not allow re-entry. Avoiding this trap brings us to the final fortress guardian, Pandora the Demon God of Disasters. With a title like that, you’d expect this to be a much harder battle, but no. Pandora is simply a giant bubble slowly drifting around the room. He has high health, making this a rather long battle, but not a difficult one. There are two other balloons floating around that pose a mild threat, but they are also easily avoided. With no other attacks, his only ability is the fact that he can turn invisible. He can’t be attacked during this time, and you might run into him, but he’s still slow moving and you should be able to predict his pattern. Now with all 3 of the Sacred Treasures in Pit’s possession, it’s time to equip them and face off against the evil Medusa. Thanks to the Wings of Pegasus, Pit now flies perfectly and the game shifts to a side scrolling shooter. Enemies will come flying at Pit from all directions as he flies towards his ultimate goal. You have to kill as many enemies as possible because this stage will actually loop if you haven’t reached a high enough score yet. The stage is actually rather long too. It starts out simple enough with those Totem enemies falling from the sky. Then it changes to ancient structures full of Zuree Ghosts and evil poisonous Daphne Flowers. There are even groups of Harpies flying around ready to tear Pit apart. The change in controls takes a little while to get used to, and I’ll admit my timing was terrible. But either way it’s a fun change coming towards the end of the game. And here she is, the evil Goddess Medusa. I must say I didn’t expect her to be a whole wall size head. Shoot out her eye with your Light Arrows and protect yourself with your Mirror Shield. She might be a wall, but she’s not defenseless. Her gaze is deadly, shown in this game as waves coming from her eyes. She also has a snake that lives in her hair named Tanatos who will jump out and attack you. Survive her attacks while you whittle away at her health and eventually you will defeat her. When her massive eye is destroyed, it reveals her true body inside. As she crumples to the ground, you know it’s finally over and that Pit has saved the day. You have rescued the goddess Palutena and saved the whole world. If you get the best ending like it did, Palutena will transform Pit into an adult warrior as well as giving him a kiss as a reward. All those hours of grinding were worth it just for that one kiss. So that’s it. The world it saved, Pit got his rewards, and everything is great. Now Pit’s struggle continues. The End…..Wait, Pit’s struggle continues? The mash-up of different genres actually works really well for this game. Letting you become stronger as the game progresses, and rewarding those who level grind early on. However, that also makes the first stages feel near impossible. It took me about 3 hours to finally beat the Underworld, but then I was able to rush through the Skyworld is just under an hour. The level design was clearly harder for the 3rd stage, but Pit starts out so unbelievably weak that the early stages could easily turn people off to the game. Then right at the end changing to basically a shooter was an unexpected twist. I’ve always been very happy with the graphics in the game. The only thing I’m actually faulting it on graphically is the fact that there really isn’t any background for most of the game. It’s just a solid black. Other than that, I’ve always enjoyed all the character designs. I think the sprite work is all very well done, not the best, but very good. Then the humor with some of the characters, like the Eggplant Wizards and Reapers makes the game very enjoyable. I love the music in this game, it’s very catchy. The main song is one of the few songs that I know I’ve caught myself humming randomly throughout my whole life. Unfortunately, there aren’t very many songs to the soundtrack, and they aren’t particularly complex compared to other titles at the time. Nothing wrong with that, they’re still good songs, but the system WAS capable of more. Then there’s the fact that some of the notes are a bit too high pitched to the point of piercing. As described in the manual, the story is actually really involved and thought out. The problem, like with many old NES games is the fact that hardly any of the story is represented in the actual game. This is really a shame. Sorry if it sounds nitpicky, but I really love a game with a good narrative. It’s a good length, but in reality, it could easily be beaten in about half the length if you are a more skilled player, i.e. not me. Shave about an hour off for my first attempt which I then restarted. Then if you don’t grind of items in the fortresses like I did you could probably cut the time in half. Still, it’s a difficult and complex game for the time. Even though it doesn’t have that many levels, all the levels are really long and it really is an enjoyable length for the game as a whole. I died 12 times during the first attempt, so really it’s only 22 deaths. Then during the Overworld stage I intentionally died a few times because of those Pluton enemies stealing my weapons. It was faster and easier to die and start the stage over than it would have been to try to buy them back. Still, it felt like I died a lot more than that. I’m actually kind of proud of that count. For simple nostalgia, this will always be one of my favorite games, but I’m not blind to its faults. The drastic difficulty curve between the start and finish of the game is too noticeable not to fault. It leaves the game very off putting to anyone not willing to dedicate themselves in the beginning, and then fails to properly reward them at the end. Then the music, as pleasant as it is, does have a few notes that are a little too high pitched, making it hard to listen to. Finally, the boss battles aren’t as engaging as they could have been. They don’t require much real strategy to beat, leaving you a bit unfulfilled. Still, the overall experience is fun, and thanks to the general difficulty of the game you really feel accomplished when you finally beat it. If you give it the proper chance, and you know ahead of time what you’re getting yourself into, I’m sure more people would like this game as much as I do. I hope you enjoyed Kid Icarus. If you did, like and follow me on Facebook or Twitter. Also leave your comments, suggestions, and recommendations. If you’re feeling real generous, you can even Donate to help me keep the site going. Thank you for reading, and I’ll see you next time.